No doubt the Hallyu Waves is HOT around the world and Malaysia can feel the heat too ever since Winter Sonata, Full House, Boys Over Flower, My Love from the Star and many others to list down. 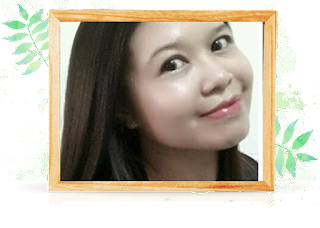 IMA one of those crazy Ajumma (head down, I am one old woman Hallyu Waves Fan) ...joining all those Gen-Y fans jumping up and down to Hallyu Waves. CN Blue, Big Bang, FT Island, B1A4, Beast, EXO, MBlaq are among this Ajumma long list favourites. Korean Cultures totally influence my lifestyle too! I am happy to give this shout out!!!! Korea Tourism Organisation (KTO) will be organising an exciting event called K-Festival @ Pavillion KL ,Malaysia dedicated for local fans of the Hallyu or Korean Wave this 8th - 10th August 2014. It is during weekend everybody!!!! Golden Triangle will be damn pack and congested with all those Hallyu fans!!!! For those who are not into the waves....AVOID this place during these period and for fans.....let us crash K-Festival and join the crowd! 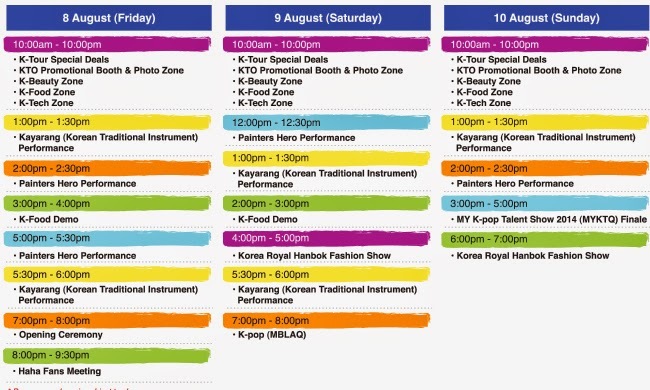 KTO aims to ignite hallyu fans' K-imagination with a thrilling showcase of Korean Food, Culture Art, Performance, Technology and Shopping from 8 - 10th August 12014 at Pavillion KL, Centre Court. The opening ceremony will be attended by participating brand and media partners, the K-Festival @ Malaysia event conceived to set the imagination alight through stimulating Korean-Centric experiences such as special K-Tour packages, K-Pop performances, K-Culture, K Food, K Beauty and K Fasion. There will be many events waiting for all Hallyu Waves Fan. 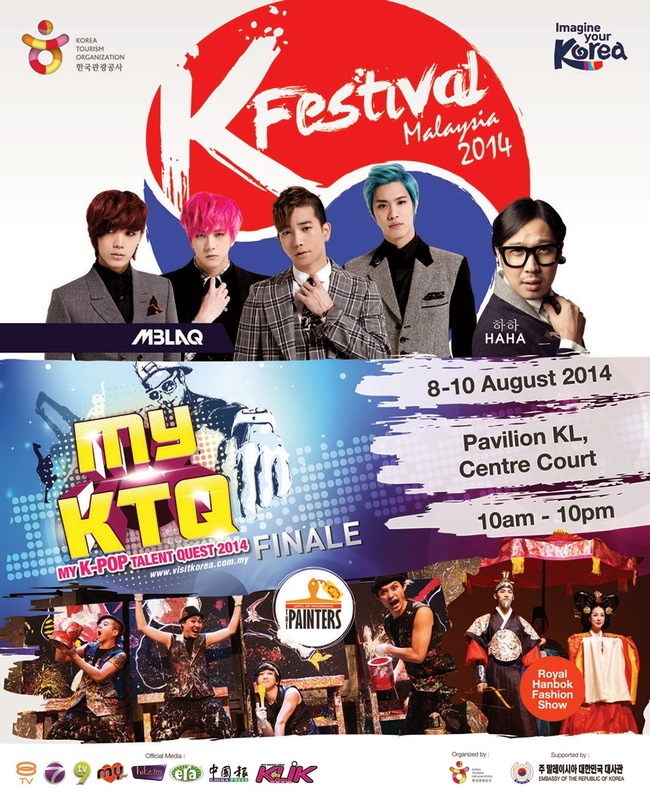 Fan can expect special appearance by 'Haroro' aka Haha, one of famous Korean Reality show Running Man cast , K-Pop band MBLAQ and participants from the K-Pop cover dance competition : MyKTQ2014 Finale - Malaysia Dance Competition will also thrill crowds with their well-choreographed moves. If you are planning to visit Korea soon....this is good chance for you to get more information before head to Korea and make your trip more memorable and exciting!